I have a new Side2 cart and would like to run Atariwriter Plus from a partition on the cart. I am unfamiliar with Spartados. I have tried starting with the X command, but it hangs. I assume there is a memory problem, and that there is some configuration that needs to be done to get this to run. The computer is a stock 130XE. I have three partitions on the cart/compact flash, and the first is set as bootable. The 128k version of Atariwriter Plus uses all the extended RAM on a 130XE, IIRC, so you'll need to run SDX in 'USE OSRAM' mode, which will make it impossible to use the SIDE driver. If there's a version of the word processor which doesn't touch extended memory, use that or get an U1MB. I ran Atariwriter Plus (with copy protection patched out) with SDX on a 130XE for years in the 90s, and presumably I used the 64K version or ran SDX in OSRAM. I have a U1MB on the way together with a VBXE and stereo pokey upgrade. I have written journals for years in Atariwriter Plus, but I may switch to Last Word if I like it. My journals are very large and use much of the 130XE memory. For many years I have used MyDos, Atariwriter Plus, and Bobterm almost exclusively on a stock 130XE. I have a lot to learn. You emailed me as well, I think? If I remember more info, I will add it here. is there a way to get SDX to use banks above the normal XE banks... I thought there was such a config, or it would be useful if it were.... I have vague recollection of a function to reserve banks to be used in conjunction with ramdisks etc... there was something about getting the most of the banks also in the same vein. If it's not standalone and only functions as part of such... How cool would it be to break that out into a standalone configuration possibility!! Edited by _The Doctor__, Mon Mar 18, 2019 5:50 AM. In short: you need a machine with more than 128K of RAM. If you have a 130XE or 800XL computer, using AtariWriter Plus is straightforward. If you have more than 128K of ram in your computer, the procedure is a bit more complex. You will need to prepare a boot floppy for AtariWriter Plus with a modified config system. FORMAT a disk in SpartaDOS format and create a text file named CONFIG.SYS file on it. try one then the other..
boot the computer with this boot floppy in Dl:. Remove this diskette and insert the AtariWriter Plus diskette. 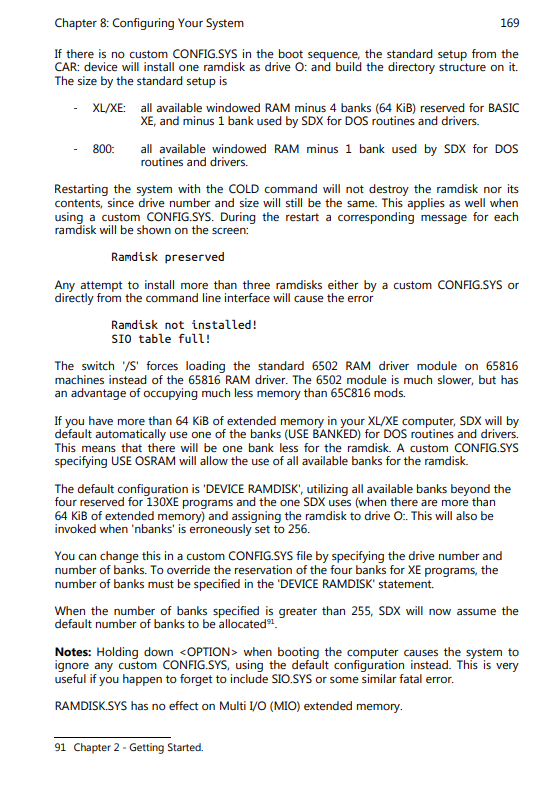 a directory of the ramdisk from the program. You can use this for temporary storage. with some other stuff. It may be in my piles of disk somewhere. You can put this on your boot disk or your boot manager. With latter Sparta DOS versions there may become a way to control nbanks to achieve this and other goals with more flexibility. Edited by _The Doctor__, Mon Mar 18, 2019 12:17 PM. With a stock 130XE or 800XL computer, using AtariWriter Plus is straightforward. Simply insert the AtariWriter Plus disk into D1: and type 'D1:X AP.OBJ'. Plus disk and then type 'D1:X AP.OBJ'. directory of the ramdisk from the program. You can still use this for temporary storage. available from http://atari8.co.uk/as it especially supports SDX features. You can put this on your boot disk, your cart using the SDX imager, or a boot manager. I have the Ultimate 1MB installed now, and I tried this suggested config.sys, but when loading Atariwriter Plus with the X command, I just get a bunch of characters and noise on the screen. which version of sparta are you using? if using X Johns advice seems sound for the newer SpartaDos X flavors, if something has broken an example ATR to the FTE/DLT crew is in order and perhaps a re write of the manual will be in order. You might post the same here. Generally if you get garbage, it's something like basic, a cartridge or driver in the way of the demanded memory area. I'm using the Spartados X in the Ultimate 1 MB. The Atariwriter Plus is the version that was patched without copy protection (if I remember correctly) for MyIDE. I have been using it with MyDOS, MyIDE for many years. I look around for a different patched version for Spartados. Thanks! I solved this issue by using a clean, unpatched version of Atariwriter Plus AP.OBJ. I didn't realize that the one I was using had been patched for MyIDE. With the Ultimate 1 MB, no config.sys is needed for Spartados. It just started right up. cool, that's why we ask to have you post it here. but we could have posted for you what works for us as well. That being said, the journey is documented for others who may come across the same issues. Looks like a win win win.